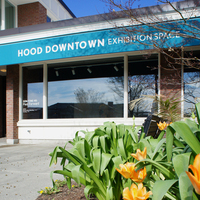 Bid a fond farewell to Hood Downtown and enjoy a special presentation that will provide a look at what is to come in the new museum, including a preview of the newly installed galleries and a peek at life behind the scenes of the reinstallation project. Enjoy live music, refreshments, and giveaways as we begin the countdown to the reopening of the museum. Remarks at 7:00 pm.